Michael Mundine is the CEO of the Aboriginal Housing Company and has worked on the Block for thirty one years. I think I came out here in Sydney forty-three, forty-five years ago, and that was where I grew up with all the early sort of apathy. 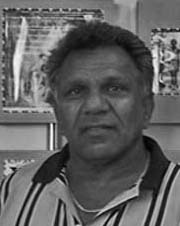 I was playing football with the Redfern All Blacks, I started in the mid 1960s playing football with them, so I was with an Aboriginal mob right from the beginning but I didn’t get involved with the very activist sort of side, you know --- protests. I worked in this place and then realised the injustice of the government that is making them protest. I never thought I’d be in that level that I was speaking out, it is just your life. Mr Mundine, first of all, thank you for agreeing to take time in this busy schedule, I know there is a lot going on this morning, but would you say a little bit about the history of The Block. Mick Mundine: Well I started in 1975 and my brother was working in 1974. I came here and I got a job and I started as a painter. Now at the time there were about six houses was getting renovated, as you know, the company [Aboriginal Housing Company] was registered in 1973 and the reason why the company was set up was a lot of Aboriginal people found it very hard to get private real estate. It was very racist in them day. So a group of ‘goomies’ [heavy drinkers] squatted in these three houses. Now at the time, Father Ted Kennedy used to help a lot of people up at the Catholic Church in Redfern in conjunction with Bob Bellear and his wife, Kaye. They were the ones who really got together, got a good mob of people from the community and got the company registered and it carried on from there. I have been working for thirty-one years now, [in 2006] and it has been a very hard role. I really feel that the company went through a vicious cycle and obviously that vicious cycle is a vicious cycle of learning for our people. In the early 1980s, this place was so beautiful, it was the caring and sharing. Our people used to sit around together of a night time, go to sleep with their doors open. It was a beautiful community. But as you know since the 1990s, the drugs started creeping into the community and we ended up with this vicious cycle of drug-related issues, crime-related issues. It was a vicious cycle. I suppose in some sort of way too, a lot to blame for this falls back to the government because of lack of funding and as you know, we have been struggling for thirty-three years for this company. But when you come to look at it, the reason why I think the government wasn’t giving funding to us is, they want this company to fail. They don’t want to see people prosper, they don’t want to see people move towards self-determination, I think they always want to keep our people down in the gutter, in the welfare mentality. I think that is why our people have done a lot of suffering in the past and I think a lot of our people lived on that hate and hope. But I think now, a lot of people are starting to feel and realise that their hope is coming to a reality of what we are trying to do now with this new project [Pemulway Housing]. It has been a hard battle but as you know, Ministers come and go, there is a change of government along the way. We have got assets at the present moment of $45 million but cash-flow is like, nothing, so at the present moment we are surviving like the crumbs from the table. But as you know, we’ve got a strong belief that the loaf of bread is coming. So we’ve gone through a very vicious cycle over the last few years but I really feel it is a cycle of learning and I really feel if you don’t experience the bad side of life, you are never ever going to experience the good side of life. I think we have to suffer, like we have to really crawl, before we stand up and walk. That is why we had to go through that vicious cycle. I am not sure that I completely understand. The Aboriginal Housing Company is an actual for-profit organisation? Mick Mundine: We are a charitable organisation, we don’t need to make a profit but we need to provide housing for lower rental, like lower rent housing for Aboriginal people who are really down and out and I suppose that is why we’ve been struggling because there wasn’t a need to make a profit and as I said before, the government when they realised that...when we bought all those houses, the last house we bought was 1994. I’ll go back a bit earlier where they are saying that Gough Whitlam handed the land over to the Aboriginal people. He didn’t. Gough Whitlam's government gave us [the Aboriginal Housing Company] a quarter of a million to renovate the first six houses...and then we got funding from the Australian Torres Strait Islander Commission (ATSIC) Federal government. We used to get individual funding, and the last house we bought was 1994, and that is when we owned the Block. So the land wasn’t just given straight over in 1973. No way to my knowledge! I’ve been here since 1975 unless somebody can prove different. We had to buy every individual house and now the government start to realise, ‘Oh gee, we bought all the houses and what they done, they handed us the title deeds.’ So we’ve got a private organisation, we are a private company, right? This land is private, it belongs to the Aboriginal Housing Company and the members. That is why the government cannot do nothing at the moment. We are standing very strong because… Frank Sartor done a bad thing of cutting our funding. We used to get $77,000 off ATSIC and when ATSIC closed down, all the housing funding went over to Aboriginal Housing Office (AHO). All the funding went over to AHO, we was given administration fund there until Frank Sartor came along. When he became the minister for Redfern-Waterloo, he stopped our funding. He thought by stopping our funding, we will fail. Then it would revert to private developers? Mick Mundine: Well they thought it was going to happen that way but do you know what, it was a blessing. What he done to us, it made us stronger. We are surviving on the rental by ourself now, okay? It has made us sort of wake up and say, ‘Hey no funding coming!’ See what we did in the past, we was surviving on, you know, we can look forward to this administrative fund coming, and once a year we used to just wait for that. But now that he has stopped the funding, it has made us stronger and the company itself. We went right back to the filing and really looked up right to the financial side of the company, and we are in a better position than we was when we got funding from the government. At the present moment, when you are funded by the government, they pull strings. Now they can’t say nothing. We are pulling our own strings at the moment so we are in a very powerful position of dictating back to the government, and I think that is a blessing— that an Aboriginal organisation can stand up on their own, sock it to them and say, ‘Hey you can’t come and tell us what to do. We are going to tell us what to do, we are going to tell you what to do.’ So I think that is a blessing for all Aboriginals to see a black organisation stand up, and by themselves. The Federal government were the first government that gave funding towards this project, this is in the Gough Whitlam days, and over the last three decades, the state government never ever put any money into this community, now they want to come in and try and take control of us. The predicament we are in now is going back to Bob Carr (former Premier of NSW) and Andrew Refshauge (former NSW Minister for Aboriginal Affairs). Bob Carr was all for our project many years ago but two years ago, three years ago, he supported our project but then because what happened as you know, the state government [is] generally driven by redevelopers and this revenue they are trying to find and the reason why they are trying to undermine and degrade us and make us look bad is because black face is no good for business. We own a piece of land here, very prime real estate that the government wants. Now apparently we are the main corridor of the expanding of the city from the city right to the airport, so there is like a big main corridor, now we’ve got a bit of land that is right in front of their face, we are the blockage and that is why we are in a very difficult time now with this new Minister for Planning, Frank Sartor. Well it is our generation because I think we are probably roughly the same era that seems to have gotten lost, that our generation dropped the ball. Mick Mundine: Yes I believe you, yes I think so. Dr Mary Trujillo: Why? As you look back on your time here, what was going on there? Mick Mundine: Well look, see, when I first come to Sydney, or when I first started with the company, I used to see all the early activists out there marching and I would think, 'What are they doing?' I used to say to myself, 'Oh gee, I’m never going to do anything like that.' But once you [are] working all the days and see the injustice that the government is doing to our people, it just make you want to stand up and fight for justice with all your heart and soul and strength. You saying ‘we got lost’, maybe we was too set in that circle of it, like ‘happy and caring and sharing’ [and] we didn’t realise that the other vicious side of the thing was creeping in slowly. Look I don’t know, I don’t know, but we did go through a lot of bad times and people have got their own personal opinion, what they think and I will say what I’ve got to say, and you can’t be down on people because that is their beliefs. I had a lot of difficulties in the past, I had people just hate me, hate me, hate me, you know, but I don’t know. I just keep showing them love and just keep talking to people. I mean if you are going to hate people, that’s resentment on your part, I think. I have survived here for so long because I just keep helping people. I think it is my destiny in life, I believe in the Lord. I tell you right from the beginning when I was only fifteen going up to my early age up to twenty, I was an alcoholic, I used to drink. I would be back at home drinking. I used to go in the bush after Mormon missions go, and drink and drink and drink until I come to Sydney. Then I started work and I got married and one Sunday morning, I just woke up and I gave up. I have been off the grog for over twenty five years and now, and then, I just go out, like, socially. But I think it is your destiny in life but I believe the Lord himself has got your life planned before you're born and I think that is where I get my strength from. Have you always been a person with a vision? Mick Mundine: Look, you go back oh, say, fifteen or twenty years ago, maybe the Lord made me get this vision, I would call it a dream. I had a dream of this company about fifteen to twenty years ago. Five part―three part happened already and there are two more to go. Now I have seen it in colour. The last part of the vision, I was sitting up here after midnight looking down on the company and the land was just like a golden yellow colour but I couldn’t see what was there, just that colour in the last part of the dream. I have seen… what do you call them? … expressway or bridges or something over round near Regents Street. I have seen building knocked down before it was knocked down. I have seen a wall in that dream get extended. Three to six months later, it happened, so I don’t know, things just come to me. Maybe it come to me because I have got to make sure of this company, that maybe my role is that this company do succeed, I wouldn’t know, I couldn’t really tell you seriously. I couldn’t really tell you. But my heart is in this place, I suppose I am much stronger, I am very strong now of my belief, and I believe the goal, the vision of the company. I have got a very strong Board that has really endorsed what we are doing. Everything that I do is endorsed from the Board of Directors and from the members too. People say, I am big noting myself. No way, I am merely doing what has been endorsed by the Board and the members. How does someone get to be a member? Mick Mundine: If you are an Aboriginal person, you can be a member. But what we are doing now, we have got about forty at the present moment, we’ve got about forty-two tenants, and we want them to be all financial members because they are part of this company and I reckon they should have a say. Then the rest of the members, we will cap it at a hundred, and the other sixty, they will be Aboriginal people that has got to be interested in this organisation. What is the fee involved? Mick Mundine: A dollar a year and then they are fine as a member, and the members are the shareholders of this land. Now as you know, you see the problem with our people in this day and age because it is black land, they think they can come and do what they want to do here, it is Aboriginal land so it is my land. This is a company, this is a private organisation, that is private land that is owned by the Aboriginal Housing Company and members are the shareholders and they have their say, not every individual black fellow, but because it is known as The Block and Aboriginal land, people think they can do what they want here. That is why they are all sitting around doing what they are doing because they think this is Aboriginal land and they can do what they want to do but they just don’t realise that this is a private company. Until they face reality and realise that; then things will change. Final question for the tape, your hopes for the future for this community, for the Aboriginal Housing Company, what would you like to see? Mick Mundine: Well as I say, all the time with our people, a lot of people got hate and they are always seeking for hope, and I think with our new project, we are going to bring that hope to reality. I believe, as I said before, we had to go through that vicious cycle, a cycle of learning. Now we are at a stage of where when we get our parent project approved, the proposal right. I don’t know whether you have heard the story. There was a burning city and out of the ashes came the phoenix bird, you know. I think this is what is going to happen here. I believe this land, well you can say, is a promised land for our people, it is a modern sacred site. I think this land [is] going to change Aboriginal people for the future. Once you get the approval from the Minister for Planning and we start redeveloping this complex, we are going to build sixty-two affordable housing --- four, three and two bedroom, we are going to have a commercial centre here building a new gym, health and fitness centre, we are going to have a business college, we are going to have an art gallery. We are going to have a hostel in conjunction with our building here, retail and office space. Once we do all that, we will change the image of this place, and I believe as I said before, it is like that burning city, out of the ashes comes that phoenix bird. I believe the Lord has got his hand on this place, I believe the Lord has his hand on this place right from the beginning when they first even tried to set it up, but as I said before, I think he is just testing us to see how strong we are, our faith and what we believe in. Our main vision, our main goal, is to make sure that we build this for the next generation, pave the way, set the platform. When the next generation grow up to be adults, at least they can start with self-esteem, respect in themselves, and be proud of [who] we are, who they are. So I think we have got a future, you know, it is going to be a beautiful future for our people, and it is going to happen, trust me, it is going to happen.